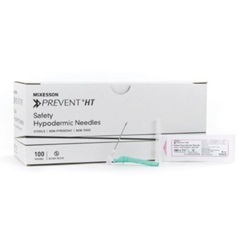 18 gauge, sterile hypodermic needle measuring 1.5" with hinged safety needle. Stainless steel needle is thin wall with beveled point. Pink plastic luer locking hub. Manufactured by McKesson. Comes in a box of 100.